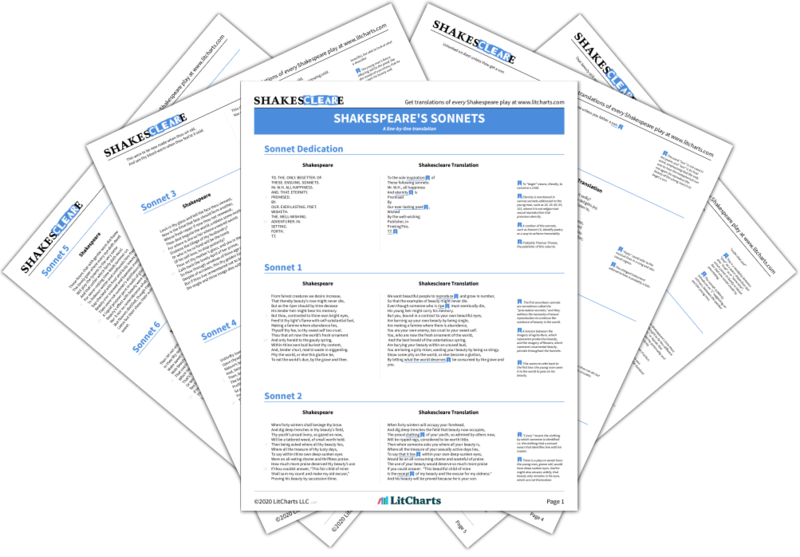 Dealing with topics ranging from love to betrayal and aging, Shakespeare's 154 sonnets contain some of the most famous and quotable lines of verse in all of English literature, including “Shall I compare thee to a summer’s day?” and “Let me not to the marriage of true minds / Admit impediments.” Our Shakescleare translation contains the complete original text of every sonnet alongside a line-by-line modern English translation, which will help you decipher Shakespeare’s imagery and intricate poetic language throughout all of the sonnets. The publisher dedicates the publication of the sonnets to the man who inspired the poet. The speaker urges a young man to have children, in order to preserve his beauty. The young man's beauty will fade, so the speaker urges him to have children to make it last longer. The speaker argues that it is time for the young man to reproduce, and create another image of himself. The speaker accuses the young man of being miserly for not passing on his beauty by having a child. The speaker argues that the young man's beauty should be preserved, as flowers are preserved in perfume. The speaker argues that to triumph over death and preserve his beauty, the young man must have children. Just as the sun begins to fall after noon, the young man will begin to decline unless he has a son. Music sounds sad to the young man, the speaker claims, because it reminds him that he is unmarried. Unlike money, which remains in the world when it is spent, beauty is forever lost if not reproduced. The young man is letting his body go to ruin. It is like a house that he should repair by having children. Nature has given a great gift of beauty to the young man, and he must cherish that gift by passing it on. Time destroys everything, including the young man. Nothing can stop this, except having children. The young man should prepare for his death and build a house that will survive him, by having a son. Truth and beauty will thrive as long as the young man reproduces. If not, they will die when he dies. The world is a theatre in which life is brief, but the speaker's lover will be immortalized in poetry. Having children would be a better way to immortalize the young man's beauty than a painted portrait. In the future people will think these poems are crazy, unless the young man has a child to preserve his beauty. The young man is more beautiful than summer and less temporary, since the poet's verse preserves him. The speaker asks time to leave the young man untouched by decay. And if time refuses, the poem will preserve him. Nature made the speaker's lover a man, so women can enjoy his body and the speaker can enjoy his love. The speaker claims that other poets praise too much, and promises this poem will speak the simple truth. The speaker and the young man have swapped hearts. The speaker tells him to be careful: they can't swap back! Like a scared actor, the speaker is sometimes overwhelmed and silenced by love, and asks the young man to understand. The speaker has captured an image of their lover in his heart, which is better than a painted portrait. Those who enjoy public honor are threatened by fortune, but the speaker's love can't change. The speaker claims to be the servant of the lover but hopes that he or she will receive the speaker's bad poetry kindly. Even when exhausted from work, the speaker can't sleep from thinking about his lover. The speaker flatters day and night by comparing them to the young man but they punish him by separating them. When the speaker is out of luck, he thinks of his lover and feels like the luckiest person in the world. The speaker is sad when he thinks of past sadness, but thinking of his lover makes him happy again. The speaker claims that he sees all of his former lovers in the young man, who contains all of the speaker's love. The speaker hopes that, after they die, the young man will value these bad poems for the love they contain. The speaker says the young man is like the sun, his shine is glorious but temporary. The speaker's lover is like the sun, shining so that the speaker goes out without a coat, and then disappearing. When the young man does something wrong, the speaker takes his side, even arguing against himself! If the speaker and the young man must be divided, the speaker will take all of the shame. The speaker adds their love to the young man's virtues, and will benefit from anything that benefits him. The speaker's poems are all dedicated to the young man, who inspires all writers and deserves all their praise. The speaker complains that, although absence allows them to praise their lover, it is a sour experience. The speaker accuses the young man of stealing his former lovers, but forgives him, fearing any more conflict. The speaker forgives the young man of seducing their other lover, but chastises the two for breaking their promises. The speaker forgives his two lovers for being unfaithful, having convinced himself that it doesn't count. The speaker sees the young man in his dreams and can't imagine how he would look better in the light of day. The speaker's body has travelled far away from the young man but his mind is able to jump great distances. When the speaker thinks about the young man, who is far away, they become heavy with sadness. The speaker's eye and heart fight for their claim over the young man, and imagines a jury deciding the fair result. The speaker's eye and heart have come to an agreement to share in the enjoyment of the young man's image. The speaker is away on a journey, and has locked up all of his possessions but he is scared of losing the young man. Anticipating the time that the young man stops loving him, the speaker shelters in his own poetry. As the speaker travels away from the young man, and his horse's groans remind him of his own sadness. The speaker forgives their horse for going slowly away from his lover, and promises to run back. The speaker compares the young man to a luxury used occasionally, in order that it can be enjoyed even more. The speaker wonders why every beautiful person seems no more than a shadow of the young man. The speaker warns the young man that, unless he is truthful, he will one day be totally forgotten. The speaker claims that, even though all monuments will fall, this poem will preserve the young man. The speaker urges the young man to think of separation as an opportunity to renew the strength of their love. The speaker is a servant and fool in love, and he invites the young man to use and abuse him all he wants. The speaker's love has made him the slave of the young man, and must wait patiently for him to return. The speaker asks: if things remain the same through time, did old writers write about anyone as great as my lover? The speaker hopes his poetry will remain standing for a long time, despite the fact that time destroys everything. The speaker's love is so great that he can't sleep, and he stays awake waiting for his lover. The speaker loves himself, but since self-love is a sin he praises his lover. The speaker prepares for time's destruction by immortalizing his lover's beauty in poetry. The speaker's anticipation of the end of all living things, including his lover, makes him sad. Nothing can resist the onslaught of time, except maybe poetry. Because of all its wrongs, the speaker wants to leave the world but he doesn't want to leave his lover. The recent times are so bad that nature keeps the young man around as proof of nature's excellence. The speaker claims the young man's beauty is a map to the natural beauty of the past, which is no longer alive. The young man's beauty is rightly praised by everyone, but they are wrong to think that his actions are beautiful. The young man will be slandered because of his beauty, so slander is therefore a proof of his beauty. The speaker asks the young man to forget him quickly, in order that the world doesn't found out about their love. The speaker tells the young man that, after the speaker dies, he should forget his name and not praise him. The speaker claims that his lover loves him precisely for his age, which means he won't be around for much longer. When the speaker dies, his worst parts will decay but his best parts will be preserved in poetry. The speaker enjoys the sight of his lover so much that he feasts on him and craves him excessively. The speaker's subject never changes, he just keeps writing new poems praising his lover, rearranging the same words. The speaker urges his lover to write in the speaker's book, in order to conserve an image of his mind. The speaker says that the young man is such a good muse that he is used by every poet. The speaker claims that the young man has been stolen by other poets, and advises him not to believe their praise. The speaker claims that his lover is like an ocean, on which both the humblest and most magnificent boats can float. The speaker claims that, even if he dies before the young man, he has already built him a monument. The speaker says that other writers write artificially, and only plain speaking is suitable to praise the young man. The speaker claims he has stayed silent because the young man's beauty so far exceeds the capacity of poetry. The speaker says that all beauty is contained in the young man, except the he enjoys praise too much. The speaker justifies his inability to speak about his love by claiming that it is more profound than any poet's. The speaker complains that the young man's enjoyment of his rival's poetry has silenced them. The speaker claims that his lover committed when he didn't know his own worth and must make a better judgment. The speaker accuses the young man of wrongdoing, but then promises to take all the blame. The speaker promises that he will accept the young man's wish to separate, despite not wanting to. The speaker asks that the young man do his very worse now, rather than saving any harm for later. The speaker claims that his lover is better than any possession, except that he might decide to leave! The speaker claims that, if the young man leaves him or cheats, he will die and go to heaven. The speaker says that the young man's face can't show anything but love, and hopes that it is not deceptive. Those people who are able to control their emotions are the best of all, but any sin will undermine their beauty. The speaker claims that sins are disguised by the young man's beauty, and warns him not to abuse this advantage. The speaker's lover can turn flaws into virtues, but pleads that his lover doesn't use all of his powers. The speaker compares absence from the lover to the winter. The speaker claims that they cannot enjoy the spring, when their lover is absent, but they will try anyway. The speaker claims that all flowers have stolen their color or sweet smell from the young man's beauty. The speaker calls on his muse to focus on the young man, in order to preserve him from time's destruction. The speaker demands his muse to inspire poetry that will preserve the beauty of his lover. The speaker claims that his love seems less than it used to because many other people have started writing poetry. The speaker complains that his muse does not inspire him to write poetry that can contain the young man's beauty. The speaker claims that he can't see any change in his lover, but knows that he is slowly aging. The speaker claims that his love is not idolatry, because he loves the young man because of his virtue. The speaker claims that the poems of ancient times are no more than predictions of his lover's beauty. The speaker will live on in poetry, which will grant him an afterlife with his lover. The speaker can't write anything new and claims that this is because they don't want the young man to grow old. The speaker returns to the young man, after a separation, claiming that their love has not diminished one bit. The speaker admits they have cheated on the young man, but claims the experiences proved that he is the best. The speaker blames their bad reputation on their occupation, and claims that they will do anything to repent. The speaker claims that they do not care about public disgrace, since they only care about their lover's opinion. The speaker claims that his ability to perceive the world has been disrupted by his love. The speaker worries that his eye is being flattered by the beautiful image of the young man, who is in fact toxic. The speaker's love is like a baby, whose nature is to continue growing. Love is described as perfect and unchanging, and located beyond the effects of time. The speaker confesses he has made mistakes, but claims he wanted to prove his lover's commitment. The speaker claims they have been unfaithful to make their love stronger, but it has made their lover weaker. The speaker is going mad from love-sickness, but still believes that success in love lies ahead. The speaker claims that his lover's past mistake means the speaker can't be blamed for his recent mistake. The speaker claims that he is wrongly accused of moral failings when others are just as wicked. The speaker has lost a notebook that he received as a gift from the young man, and makes an excuse. The speaker does not trust what has happened in the past, or in the present, only his eternal love. The speaker argues that his love does not depend on external circumstances, and stays true and consistent over time. The speaker claims that he is not interested in worldly honors: his love is a simple and honest offering. The young man grows more beautiful with age, but the speaker warns that even he will eventually die. The speaker has a mistress who has dark eyes and dark hair, which he claims is the new standard for beauty. The speaker watches his mistress playing music and envies the keys that her fingers are touching. The speaker warns against lustful activity, which makes a person mad. The speaker admits that their mistress is not ideal like the women in other poems, but defends her uniqueness. The speaker says that his mistress is cruel, which must be why other people say that she is not beautiful. The speaker claims that his mistress's eyes are compassionate even when she is being cruel. The speaker pleads with his mistress to release the young man from the prison of her love. The speaker complains that his mistress has also seduced the young man, and now both of them are unfree. The speaker's mistress has many desires and many suitors, so he begs her to choose him. The speaker complains that his mistress, who has had many other lovers, won't let him come near her. The speaker blames love for preventing him from seeing the truth, that his mistress is evil. The speaker knows that his mistress is unfaithful but claims that he prefers to believe her lies. The speaker pleads with his mistress not to look angrily at them and, also, not to look at other people. The speaker threatens that, if his lover does not pay attention to him, he might go mad and speak badly about her. The speaker claims that he is not pleased by his mistress's appearance, but is devoted to her nevertheless. The speaker claims that he is no more sinful than his mistress, who should treat him as she hopes to be treated. The speaker describes his mistress chasing after someone else, and hopes that she will return. The speaker confesses that he loves two people, and worries that one of them has seduced the other. The speaker fears his mistress is about to tell him that she hates him, but she sees his face and decides not to. The speaker asks his soul why it focuses on mortal pleasures, rather than turning towards eternity. The speaker considers his love as a sickness and claims that he is past cure. The speaker laments that love has caused his eyes to see badly and to doubt the judgments of everyone else. The speaker claims that he has given up everything to worship his lover, who says she does not love him. The speaker wonders how his mistress, who has such obvious flaws, can seem so much better than anyone else. The speaker defends himself from his mistress's accusation and promises to be her faithful servant. The speaker admits that he knows his mistress has broken her vows, but still claims that she is virtuous. The speaker has become sick with love, and claims that no remedy can save them, except their lover's gaze. The speaker visits a bath where he hopes to find a remedy for love sickness, but the cure doesn't work.